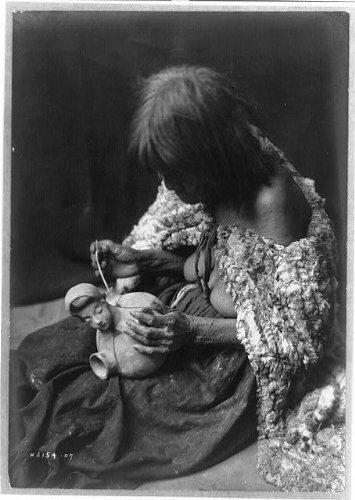 Photograph Description: The Mohave potter Creator(s): Curtis, Edward S., 1868-1952, photographer Date Created Published: c1907. Summary: Old woman with rabbit skin blanket around shoulders, painting design on piece of pottery with yucca stem brush, Arizona. Notes: Edward S. Curtis Collection. Curtis no. x2154-07. Published in: The North American Indian Edward S. Curtis. Seattle, Wash. : Edward S. Curtis, v. 2, p. 58. Subjects: Indians of North America--Arizona--Women--1900-1910. Indians of North America--Arizona--Arts & Crafts--1900-1910. Mohave Indians--Women--1900-1910. Mohave Indians--Arts & crafts--1900-1910. Pottery--Arizona--1900-1910. Book illustrations--1900-1910. Photographic prints--1900-1910. Portrait photographs--1900-1910.